A dispute among Bible scholars is whether the Hebrew word “olam” in Micah 5:2 refers to an ancient time in temporal history or to an everlasting time in eternity. Clearly, Walter Kaiser, Jr. sides with the interpretation that points towards eternity. But from a Christian perspective the dispute is somewhat moot because we know that Jesus (as both man and God) descended from the ancient line of David, and also from his eternal generation as the Word of God. In either case, at a minimum, the prophet Micah correctly foretold the birthplace of Jesus in Bethlehem and his descent from the ancient line of David. Under either scenario Micah’s prophecy of the Messiah to be born in Bethlehem is quite remarkable! 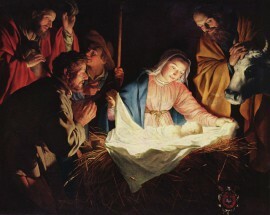 Image: The Adoration of the Sheperds by Gerard von Honthorst, 1622, Public Domain, U.S.A. (per Wikipedia). P.S. See also Micah 5:4 which demonstrates that with the fulfillment of the prophecy the Messiah’s dominion and greatness shall extend “to the ends of the earth,” a prediction of the greatness of the Messiah (see Pulpit Commentary). ← IT’S A WONDERFUL LIFE! Uncle Tommy thanks for this information this makes Christmas more meaningful to me.